Context is for the weak! 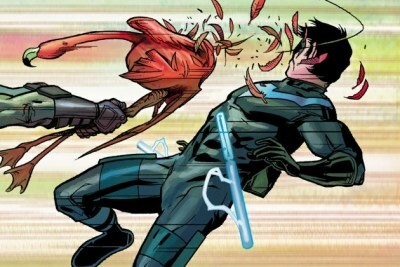 The Freudian implications of Bruce bondaging "Jason" with the batcape to one side, does it get any better than Batman hitting "Nightwing" upside the head with a robot flamingo? I think not. 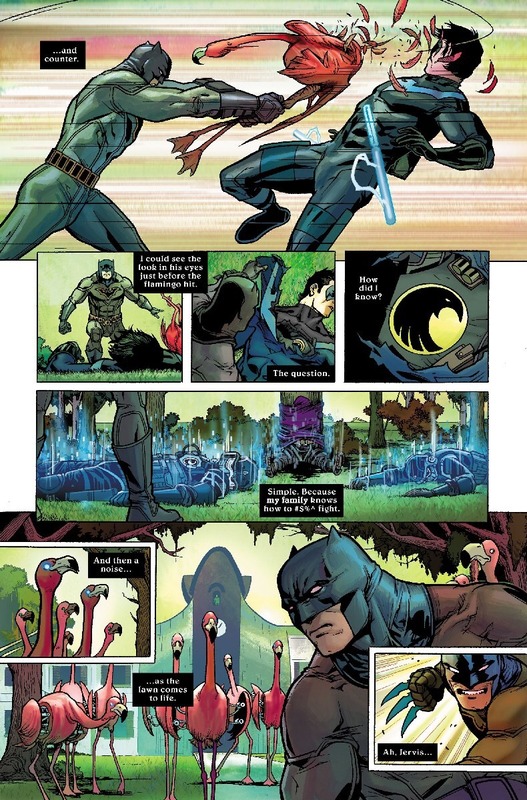 Written by Scott Snyder, art by Giuseppe Camuncoli. 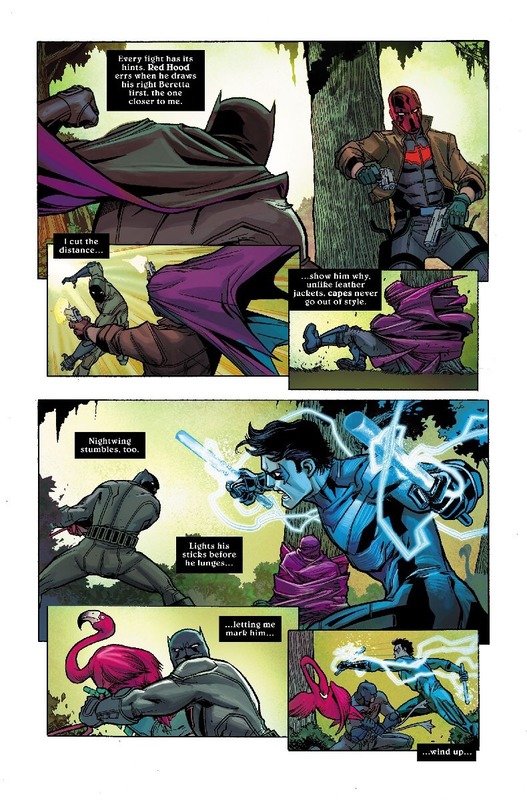 You know you've hit the apotheosis of Batman villainy when you see Batman hit Nightwing with a flamingo and think "Okay, is the Penguin or the Mad Hatter behind this?". "...my family knows how to #$%^ fight." This is a horrid piece of dialog for Batman. Are we sure this isn't All-Star Batman and Robin? Seriously, why not, "I trained them better than that" or "They wouldn't be that sloppy, even after all those years away." What's wrong with Batman swearing? Batman has never been one for swearing, it usually, as here, seems forced and out of place when he does. Clearly the word was "fist", but with a different connotation. It's not that bad. All it does is emphasize a point. It's probably how he'd want to go, a cause of death so outrageous NO ONE would ever forget it. I'm pretty sure that for most people, capes went out of style over a century ago. What's going on with the cape in that third panel, anyway? Did Batman borrow the Cloak of Levitation from MCU Doctor Strange? Weirdly, I think there's precedent. Way back in the mists of the past, when Tim was still just known as Robin and Dixon had just left the title, I have a vague emory of a bad guy grabbing Tim by the cape. He hit a release and it not only separated the cape from his collar, but activated a security measure that had the cape start to contract and tangle around the grabber. I guess this is the same principle, when separated, the cape will contract around the next thing it hits. I think that's Cocoon Mode - Snyder!Batman's had that in his arsenal since Future's End. It's probably less Dr. Strange's cloak and more Cap's magnet-mounted shield - additional functionality through engineering. "Logo-throwing powers! I should--wait, I already throw my logo at people. Something to wrap them up, then."